Another important factor is the weather-related crop failures worldwide that have drawn down global grain stocks for several years. 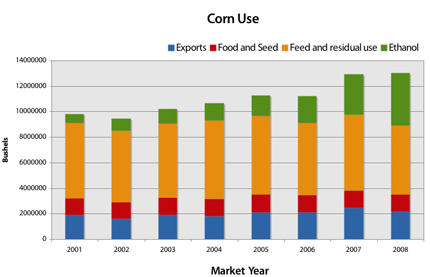 All of these factors contribute to the increased demand for corn as both food and fuel stocks while recent weather disturbances in the Midwest now threaten reduced production for 2008 and even lower corn stocks. Source: The World Bank. 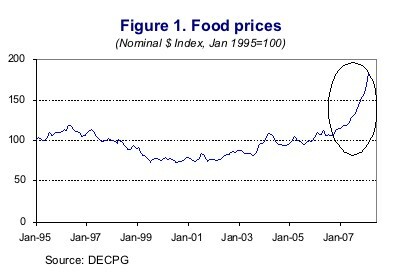 “Rising Food Prices: Policy Options and World Bank Response.” 2008. Also on the call, Dr. Elywnn Taylor, an Iowa State University climatologist, pointed out that the supply conditions this year due to inclement weather are approaching the poor supply conditions during the nation’s historic 1988 drought, which cut the corn crop by 28 percent and created great volatility in the markets. Making the problem worse, the new demand conditions (such as biofuels, the weak dollar which makes our exports attractive, and the rapidly growing middle class in Asia), may create even more volatility in the price of corn and the price of foods that depend on corn. Last year, 20 percent of the U.S. corn crop was diverted to fuel. One factor was the high price of oil that made ethanol competitive as a transportation fuel. Source: Environmental Working Group. Data compiled from the U.S. Department of Agriculture Economic Research Service, Feed Grain Tables 4 and 31. The additional demand for corn as fuel has left very little cushion between the supply and the demand for corn. These problems are magnified in 2008 because the U.S. is predicted to plant eight percent less corn than in 20075 and problematic weather forecasts for 2008 may further reduce harvests and exacerbate the competition between food and fuel. To a disturbing degree, then, the critical assumption in the nation’s “plan” for ensuring that ethanol policy does not dramatically disrupt the food economy, comes down to this: good weather. For climatologists and agricultural economists, the hope is that the current cold and wet weather conditions that have delayed corn planting and interfered with crop emergence do not continue. Unfortunately, comparisons between this year’s weather events and two historic weather disasters are already occurring. The 1988 drought and the 1993 excess water events reduced corn production by 28 and 24 percent, respectively.